Exe Valley Leisure Centre, Tiverton is a new building which includes two swimming pools. The Centre opened in late 2002. This double-sided glass feature runs the full height of the building, announcing and defining its identity. The streak of blue is visible from two directions on the approach to the building. 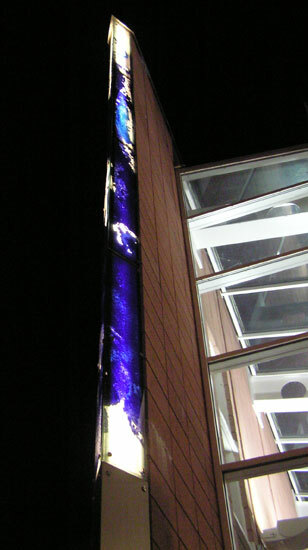 This is Gabriella Falk's first architectural glass commission for a public building. She is keen to take on further glass commissions.